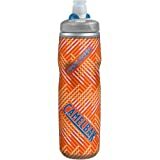 The 600ml CamelBak Podium Chill Insulated Water Bottle uses double-walled construction to keep water cold long after you start pedaling. The self-sealing valve delivers a high flow of water and eliminates annoying drips and spills. Positive lockout for leak proof transport. 5.0 out of 5 starsGreat quality. 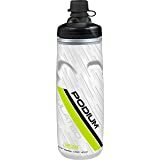 These are my favorite bottles for cycling and everyday water consumption. 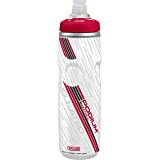 Ive been using them for years and have never had issues with leaking, sucking, bad water taste or fitting in a standard bottle cage. Currently I have 2 Weil CF cages and the bottles ffit perfectly. This is probably my 8th set that I have purchased. Im posting this to show others how to clean the top part. If you use anything other than water in them (especially with sugar content) they will get nasty pretty quick if not kept clean. Even with only water use they can tend to get moldy over time, especially in humid climates. The molded rubber piece can be pulled off the top part of the bottle cap. Once you pull it off you will see that there is a plastic insert that goes into the rubber piece. Pull this out to clean it. It takes a little bit of 'rolling' the plastic piece to seperate it from the rubber top. Once you do it youll see what I mean. It gets easy once you get the hang of it. If the pieces are moldy, sometimes it tends to collect under the 4 slotted spaces in the plastic insert. You can usually use a toothpick or small pointy object to clean the crud out of this area. If you need a real good cleaning let them sit in vinegar over night and it makes it easier to rinse everything out. Make sure you dont lose the small o-ring on the bottom of the plastic insert. That needs to be snugged up tight on the insert before you slip it back into the rubber molded piece. Once you cleaned the insert and rubber piece slip the insert back into the rubber. Make sure its correctly seated, the cylindrical tube should be pointed straight down. Then you have to work the rubber piece (with insert) back onto the top of the bottle. Roll it around to make sure it seats correctly. When the bottles are new it can take a little bit of work to get it seated correctly. Doing this regularly will keep the top rubber drinking valve clean and good to use for a few years. Ive attached some pictures for reference. Great bottles. I originally bought this for my new bike so that I could drink and steer at the same time. It turned about to be too big for my water bottle holder, so I gave it to my father without another thought. He has Parkinson's, which makes it hard for him to control the muscles used for swallowing (which is a huge problem because he regularly has to swallow huge pills) and his motor skills in general for tilting regular bottles to the correct angle for water flow. This thing is our savior. Before when we went out somewhere, he would be nervous to take his pills in public for fear of choking on them, but now he just needs to squeeze this bottle and the strong jet of water helps get the pills down easy. Or if he can't lift the bottle enough, water will come out if he squeezes. He loves feeling less dependent on my mom and I for something as simple as drinking. 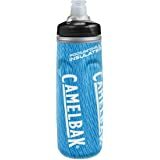 I know that this isn't the general use case for this bottle, but I'm very thankful to CamelBak for improving my dad's quality of life just a little. I love these. 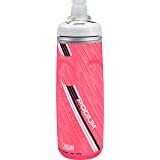 I bought three (one for cycling and two for running) to replace bottles that required me to pull up the valve top so I could drink (one had busted). I only wish I had replaced them earlier. 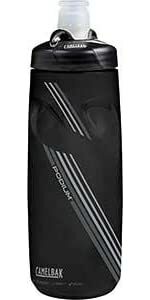 These make taking a quick drink super easy - especially hike on a bike. Just point and squeeze. 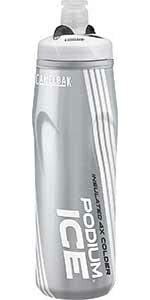 I have found that I am drinking way more water while cycling with this bottle and that is a good thing. Now I debate buying the larger size! I have run for over an hour in warm temps and the water is still very cold at the end, even if my ice cubes have melted. I wholeheartedly recommend these. The price on this water bottle was too hard to pass up. 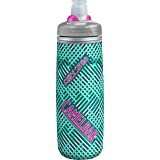 Camelbak has the best water bottles. And for a mom of three active kids, water bottles are a daily necessity. 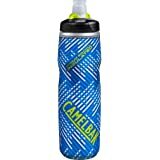 This one was very similar to our $25 camelbak one except that the lid doesn't tighten 100% on this one. It has a slow leak out of the side because of it, but as long as it's kept upright it's fine. 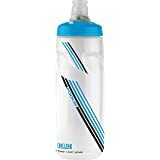 Even though this is just for kids at school and not for someone training for an olympic event, this is still one of the best water bottles I've found. And I've tried them all over the years. 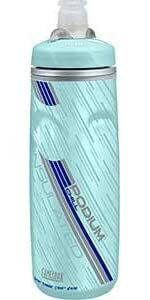 It would definitely be a five star product if not for the slow leak. We need it too badly to return, so I'm sticking with it. The insulation is decent. It kept my water from getting hot in the sun and from freezing when temps dropped. It's no Yeti cooler, but it's better than a standard bottle. This size just fits my full suspension bike (2013 Kona Satori, large frame). I like to carry as much as possible (not a hydration pack fan) and this is the biggest one that'll fit. 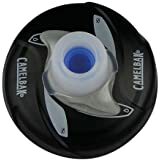 If you've never tried CamelBak's mechanism, it works great, doesn't leak (even in the "open" position), and you can replace the valve without tossing the bottle. 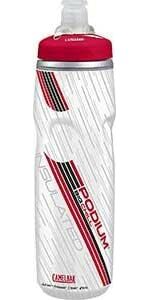 Overall, it's the best bike bottle out there.